Three days in and we are on a roll! I don't know about you, but I'm loving this already. 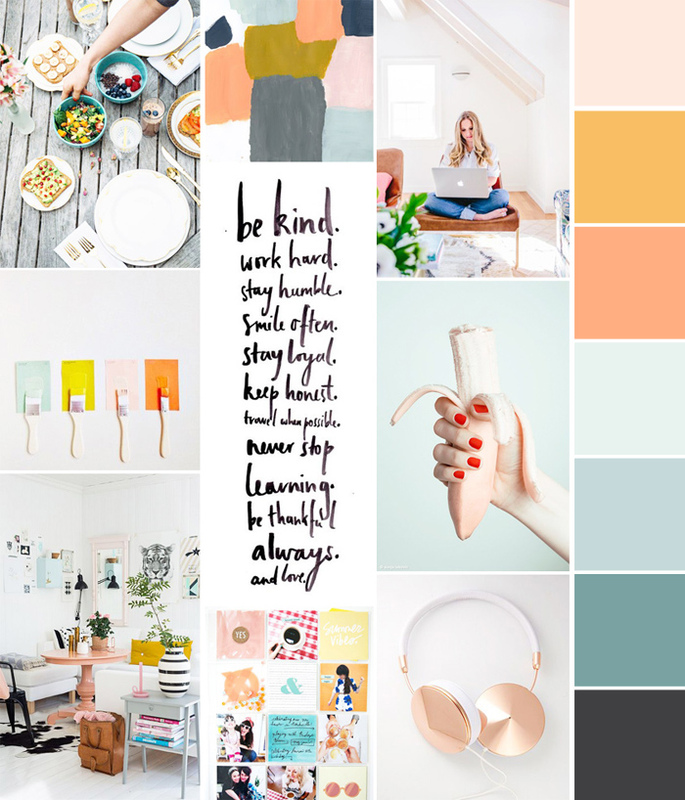 If you've followed Brave Love Blog for any length of time, you know I love a good mood board. I started making them last year as vision boards with my Powersheets, and I will use just about any excuse to do so. I thought it would be fun to invite everyone into the process with today's prompt. Thursday, September 3: Create a collage or inspiration/mood board that describes your blog. picnic. paint. laptop. paint brushes. be kind. banana. living room. project life. headphones. I created the collage pictured above during the last makeover for Brave Love. Pops of bright color mixed with muted version of the same, plenty of white space, brush lettering and rose gold. This is a moldboard after my own heart. When I think about Brave Love I imagine a comfortable place for people to return to, full of glimpses of the every day along with inspiration, encouragement, and a cohesive look. The list of ideas/ideals perfectly suits my vision for this space, and I hope to someday have it hanging in my office. Brave Love is my safe space, and I want it to be inspiring for me, too. In the future I hope to include more DIY, project life, and home decor, so I threw a little of that in there, too. It makes me happy just looking at it. Now how about you? I can't wait to see your blog in collage form!